PUJ’s Terminal B lounge features an infinity pool overlooking the airstrip. Award-winning Punta Cana International Airport in the Dominican Republic is aiming to launch its U.S. Pre-Clearance facility in November this year, and has begun designing a third terminal, according to Rafael Smith, PUJ Director of Landside & Terminal Operations. Named one of ACI’s “Best Airport’s by Size and Region” in Latin America and the Caribbean for the past three years, PUJ prides itself on its passenger services, says Smith. Offering direct flights from over 26 countries, 64 cities, and 90 airports around the world, the airport served 7.8 million passengers in 2018, up from 7.4 million passengers the year before. It is the busiest airport in the Dominican Republic and second busiest airport in the Caribbean. The sustained growth of Punta Cana International Airport over the past five years has gone from the construction of a second airstrip, to the latest construction of a new terminal building. The addition of the U.S. Pre-Clearance this year has been a priority and will be a major step forward in customer service, says Smith. The Pre-Clearance facility was first approved by the U.S. government in 2016 for implementation in 2017, but Smith is hopeful that it will finally get going this year. “We are now waiting for approval from a Constitutional Tribunal in the Dominican Republic, which we expect at any moment,” Smith tells TMI. Smith says that the U.S. and Canada are the main source markets for Punta Cana with more than 50% of the traffic, followed by Europe and then the rest of the world—South America and the Caribbean. Russia, which had been a major market until its financial crisis several years ago, is also making a comeback, he reports. As soon as the Pre-Clearance opens, Smith says that the airport will go forward with plans for the third terminal. While T3 is just in the design stage, Smith says that the airport will definitely continue working with Duty Free Americas as its duty free concessionaire in the expanded space. “We have a strategic alliance with DFA and they work with us closely. We are very satisfied with their service and the variety of their offer in our airports,” says Smith. Terminal 3, like the other two terminals, will feature specialized multi-brand stores, gift shops, souvenirs, and branded outlets from DFA, he says. In addition to its shopping, PUJ has put itself on the map with its VIP lounges. 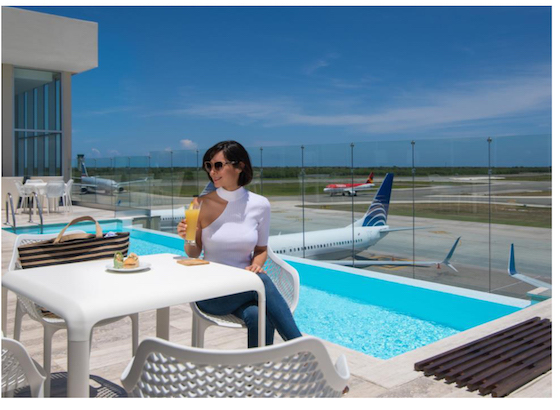 Its Terminal B lounge features an infinity pool overlooking the airstrip – making it the first airport in the Caribbean to have a pool at an airport terminal. Smith says that PUJ is looking to create a VIP lounge in Terminal A as well. In addition to its commitment to providing service for the passengers, Smith says that PUJ has invested significantly in technology, and is now in conversations with the Dominican government to introduce automatic control boarding kiosks, and other ways to expedite the check in of the passengers.